﻿ Copenhagen East Residences, Cebu - SAVE ON AGODA! Have a question for Copenhagen East Residences? "The place is neat and spacious!" "Aside from the inexpensive rates, the rooms are clean and comfortable to lounge for travellers." 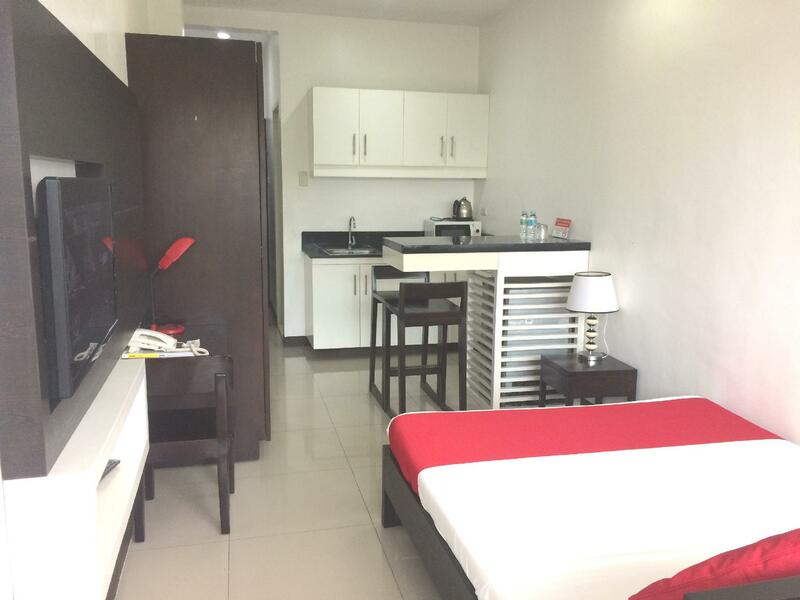 "A very nice place to stay, with ref, microwave, heater.it's..."
Whether you're a tourist or traveling on business, Copenhagen East Residences is a great choice for accommodation when visiting Cebu. Situated only eight kilometers from the city center, guests are well located to enjoy the town's attractions and activities. The facilities and services provided by Copenhagen East Residences ensure a pleasant stay for guests. A selection of top-class facilities such as a car park, laundry service, car rentals, airport transfers, and safety deposit boxes can be enjoyed at the hotel. Guests can choose from 42 rooms, all of which exude an atmosphere of total peace and harmony. The hotel's host of recreational offerings ensures you have plenty to do during your stay. Copenhagen East Residences is a smart choice for travelers to Cebu, offering a relaxed and hassle-free stay every time. "It was very nice to stay overnight, just after arrived from..."
Planning to stay there for one night but the place was good, staff were very friendly, rooms were spacious and it is located along the way so I chose to stay for another night. Room rate is definitely very cheap compared to others. Would love to stay again! I don't like the way they let me pay the stain bedsheet without even letting me see to prove that it will not go out... They charge me for one thousand pesos..that's too much for a used bedsheet and never give me a receipt for that... I hate that organization...I will never recommend this hotel...never! I stayed here for the second night, and it's just great. Big room, very clean, super friendly staff. The only thing I can complain about is that there is nothing to do in this neighbourhood outside. It"s pretty far out from the city center. Just rent a scooter and your problem is solved! the entrance of the hotel was a li'l bit creepy because the light was going on and off. the receptionist was very friendly and accommodating. the room was clean. there were no elevators so if your room is at the 3rd floor (like ours), you really have to climb through stairs. it's difficult to find a vacant taxi specially during rush hours, we recommend using Grab. Overall, the hotel is decent and good for those who are on tight budget or just want somewhere to stay that is near the airport. The facade of Copenhagen East Residences does not give justice to what's inside. We didn't expect the rooms to be spacious and clean. And the staff is very friendly and assisting. It's really worth the price. We'll book again! Pros: • Place was clean and well maintained; property looks new. • Comes with enough amenities e.g. refrigerator, microwave, wifi. • Staff was friendly, check-in and check-out were seamless. • Our unit had a balcony, which was nice. Cons: • Not so convenient location, but you can get food delivered if you don't feel like walking. Good value for money if you need a room for the day or between flights. Around 120pesos (15min) from the airport. No elevator, but security guard and bellboy will help with your luggage. 7-Eleven is 5 min walking away, we ordered food from KFC, which was very quick and the reception called as soon as it arrived. Will stay again if I fly via cebu! Good place and amazing price! very clean modernistic approach in interior near airport but not near eatery Sometimes promo rate brings great value and sometimes gets popular without promo. Really comfortable stay. Sometimes the air con is not working well maybe need to clean filter or put new freon or coolant tube inside to get the AC to work better. Excellent Value for your money very close to airport next to old bridge so very convenient near Lapu lapu Mactan Mandaue. Easy to take habal or taxi to Parkmall or long walk of 30 minutes if you wish. 24 hour Late night check in possible. Pros... clean, nice facilities, location depends on where you want to be Cons - taxi drivers don't know the place, got lost one evening even after showing the driver a map and not being too far away. I ended up jumping out after roaming around endlessly. Very clean, friendly staff, very comfortable, not expensive with fridge, microwave and kettle. However, no elevator lift; has limited parking space and only a few channel is available to watch. Clean rooms. Large, small comfortable beds. Attentive staff. Cons...no elevator. Room was on 3rd floor. There are no places to eat close-by. Only a convenience store across the street. Pros: Room is spacious and long with the followings extras: Small Fridge, microwave oven, water heater with a small dining area for 2 with balcony and cabinet with table for laptop Alley is very wide Cons: no elevator (as advertised on the web) and you have climb 75 steps water taste a little salty hard to find decent restaurant in the area Overall, room is cheap and worth your money! Staff accommodating esp the electrical maintenance when i had issues with my camera charger. place is good if you prefer to stay in a quiet neighborhood, near 7 eleven and walking distance to mandaue bridge if you want to experience crossing by foot and take scenic pictures of the lake. balcony overlooking superb. they have closet with hangers and microwave. only missing is flat iron and hair dryer if traveller is really in need of pressed clothes and dried hair before going out. otherwise whole stay is great. will come back for sure. Prices seemed to go up because of the popularity of the place. Everything was fantastic and staff was eager to clean room. Very close to airport and parkmall considering the fast taxi meters. The slight drawback is that there is no food room service so you have to go downstairs during daytime if you want food or order take out service by phone. near airport..helful staff and clean facilities..even though they have no elevator and our floor was located on the 3rd floor. they assisted us in our luggages.. and helped ys from finding a taxi 1am in the morning..